HIGH END MUNICH – May 18, 2017 – Today, HARMAN International, a wholly-owned subsidiary of Samsung Electronics Co., Ltd. focused on connected technologies for automotive, consumer and enterprise markets, and CANTON, a German manufacturer for High End speakers and home and car sound solutions, are showcasing their latest car audio solution at the High End Munich 2017. 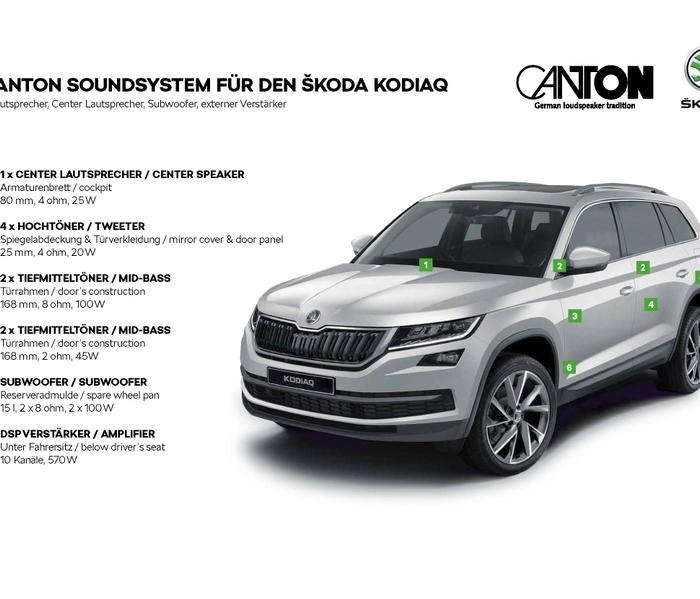 The sound system in the all new ŠKODA Kodiaq is the result of the combination of CANTON’s home audio know-how with HARMAN’s automotive sound design expertise. 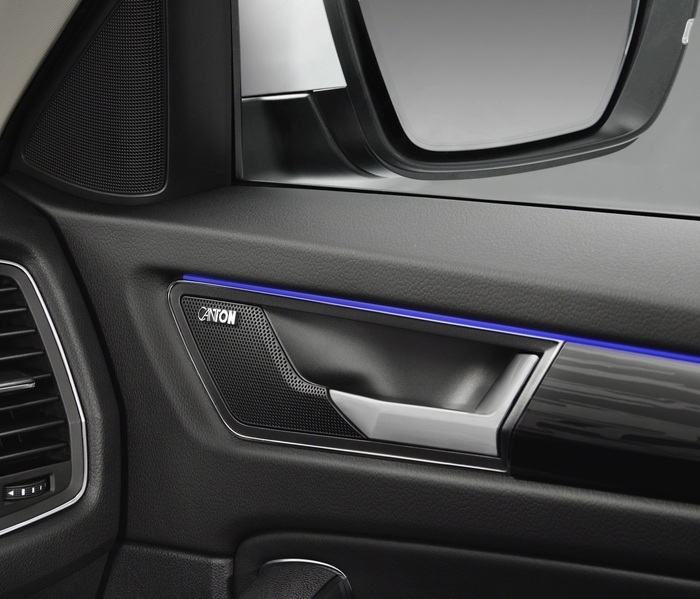 Drivers of the new SUV will be treated to an unmatched listening experience for a vehicle in this class. The tailor-made premium audio system has been precisely tuned to the Kodiaq’s interior by HARMAN’s and CANTON’s sound engineers, who are amongst the finest in the world. The system perfectly matches the design concept of the new ŠKODA Kodiaq and comprises a 10-channel, 570 Watt DSP stereo amplifier and 10 high-performance speakers delivering crisp and clear sound. The fantastic sound experience in the ŠKODA Kodiaq is generated by one 25W center speaker in the dashboard, four 20W tweeters, four 45W mid-bass speakers and one 2x100W subwoofer. The system is designed to deliver a perfect sound experience to all passengers no matter where they are sitting in the car as well as balanced sound for all music tastes. Dynamic vehicle and road noise cancellation ensures undisturbed listening pleasure while CANTON surround sound technology guarantees a true real-life listening experiences. The sound system is optional providing a fantastic value-for-money ratio in addition to an outstanding audio experience. CANTON manufactures home and, together with HARMAN, car audio equipment. CANTON is the last true German loudspeaker manufacturer in the industry most famous for its wooden loudspeakers, which are still handcrafted in Germany. CANTON’s competency is the art of finding the best sound for every ear, need and budget. For over 40 years, CANTON has been combining innovative technologies, premium quality and an extraordinary range of speaker models and designs – to produce unique and individualized sound qualities.